I'm back with another look at a classic AD&D 1e module - this time, the iconic G1-2-3. I'm actually in the middle of running this right now (my players have made it all the way to G3 - you can check out our campaign journal over on Dragonsfoot here) so I've been contemplating where these adventures might work best on Mystara. The G series, by Gygax himself, kicked off the practice of publishing tournament scenarios as modules. In this case, the adventures debuted at the Origins tournament in 1978, recounted in Dragon #19 (October 1978). 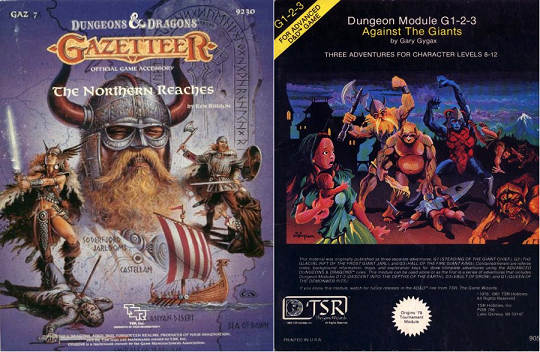 The original setting seemed generic (these were the first modules ever published by TSR), but later established to be Greyhawk when the Folio came out (1980). The series in general and G1 in particular was inspired by "The Roaring Trumpet" by Fletcher Pratt and L. Sprague deCamp (and is recommended reading for anyone running these). With its strong nordic connection, the Northern Reaches are a natural setting for these modules in Mystara. In terms of specific locations for each of the giant strongholds, I couldn't help noticing the volcanoes in the middle of the Makkres mountains for the Hall of the Fire Giant King. 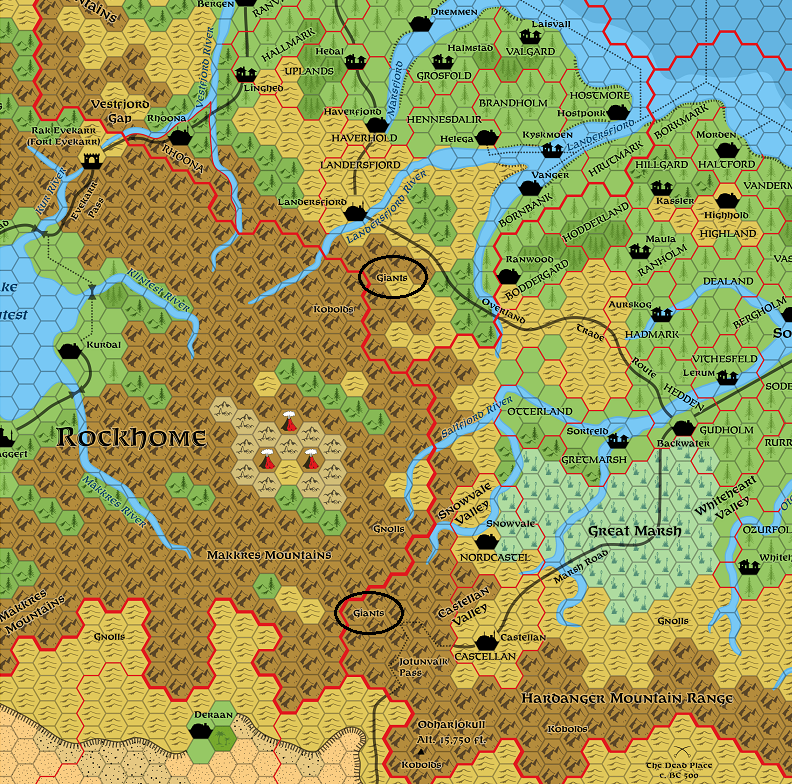 They're represented by a single hex on the Continental map from X1, and as broken territory with 3 volcanoes in Gaz 7. I'm not aware of anything else that's been developed for this area. The plain about is most evil and drab appearing. The sky is gray and filled with sooty clouds. A distant volcano can be seen, and far to the south a glowing river of molten lava moves sluggishly down a slope and out of sight. It is hot, and the air smells of heated rock and metal. The ground is full of cinders and sharp rocks. The place is lit by night with dim red light from flaming gases shooting forth from the earth and from molten rock. For the Steading of the Hill Giant Chief and the Glacial Rift of the Frost Giant Jarl I reviewed the map from Gaz 7 to see where giants are known to dwell. There are 2 areas (circled above, reproduced from Thorfinn's most recent updated version of the region). I figured the northern area, in Vestland, would be more fitting for the Steading of the Hill Giant Chief (the hex is hill terrain, after all). So definitely high enough for a glacial rift near the Jotunvalk pass. 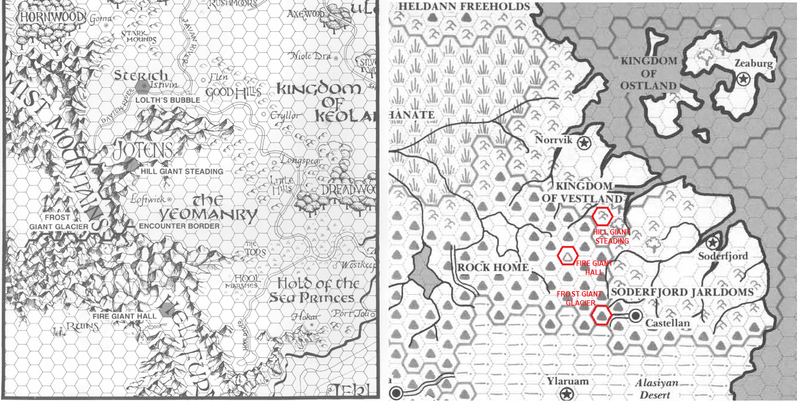 There are, of course, frost giants in the Altan Tepe mountains of Karameikos, but for the purposes of G1-2-3 (and based on the close coordination of giantish raids) a closer grouping of the 3 strongholds makes more sense. Gaz 7 also works well as a unified setting for all 3 adventures. The prominence of other humanoid races (gnolls, trolls in G3) fits particularly well with material on these races in Gaz 7. I've previously written about Kick-starting a Northern Reaches campaign using module B9. There's also an adventure published in Dungeon #23 called "The Vineyard Vales" (levels 2-4) set in the Soderfjord Jarldoms. Finally, there are 3 complete adventure scenarios presented in Gaz 7. "Falun Caverns" (pgs 37-47), "The Defence of Otkel's Stead" (pgs 47-51), and "The Jarl's Hall" (pgs 51-59). X3 "Curse of Xanathon" (levels 5-7) and X13 "Crown of Ancient Glory" (levels 7-10) are both set in Vestland, and could serve as adventures also leading up to G1-2-3 (levels 8-12). However, while X3 is fully integrated with Gaz 7, X13 doesn't mesh well, and was pushed 150 years into the future by Ken Rolston. Fortunately, there's a wealth of adventure hooks in Gaz 7, or the PCs could have adventures in neighboring regions. As a neat alternative, enterprising DMs might wish to transport high-level PCs to some of The Nine Worlds for these adventures (detailed as outer planes on pgs 62-63 of Gaz 7). For example, the Glacial Rift could be in Niflheim, and the PCs could travel there (using the first Thor movie as a template!) and the Hall of the Fire Giant King is even mentioned to be in a Muspelheim-like environment. Nice work - I really like this idea and you have made them fit in really well - much better than I expected to occur naturally from existing maps etc. Very interesting. Such a natural fit. I owned both these products at one point but never thought to put two and two together. I guess the main question would be whether to keep the Drow as the main villains, especially in G3, and continue with D1-3 and Q1 or else to incorporate the shadow elves for a more Mystara-centric campaign, which would be more work but interesting to see. If it's in the Northern Reaches, what about using the Mordiswerg? I also like having Moulder dwarves in the campaign. Now I need to get a Northern Reaches campaign going again! I'm going to echo the others and say that I think this is a great placement for those modules! That region is under contention between two dragon rulers in the area, the white dragon Druuwor and the black dragon Jargnir. See Bruce Heard's Who's Who Among Dragons article for more information on those two. The Dragon Lord chronicles also gives several hints as to the location of the ancient dwarven city of Darmouk. One possibility is in that area (deep underground, of course). You can check out Threshold Issue #16 for an article on Darmouk, complete with sidebars for a placement theory in that area. Of course, none of that prevents you from placing those modules in this area, in fact I would hope that they instead give ideas for expanding out the region and adding more adventure possibilities. I'll also second Havard's suggestion of the Mordrigswerg, and expand upon that by recommending the Darmouk article from Threshold. There are indeed Mordrigswerg inhabiting that city, along with at least two strains of dwarves descended from the ancestral dwarven stock, kobolds, goblinoids, dragon treasure, Blackmoorian magitech, and more. That's a very interesting idea. I've added a link to this topic of yours to the GAZ7 The Northern Reaches and G1-3 Against the Giants pages on The Book-House on The Piazza, in the hope that more people can find your adaptation advice. I am now sold on the idea of using G1-3 in the Northern Reaches with the Moulder dwarves replacing the Drow. Will be adding this to my adventure path for my D&D campaign. Thanks everyone! Thanks for the link to Bruce's article! I seem to remember some idea that dragon domains overlap and essentially ignore non-draconic borders and territories, so I don't think there would be a problem with Druuwor or Jargnir. Plus, that would even help to explain the presence of red dragon Brazzemal in G3 (to keep the other two dragons from pestering the fire giants). I love the idea of somehow incorporating the ancient dwarven city of Darmouk, as well, for a truly Mystaran underpinning to the G series! What makes G1-3 particularly easy to use with B/X or BECMI is the lack of any stat blocks for the monsters (typically, only the hp totals are given). Please share whatever you develop!